The Moebius pseudonym, which Giraud came to use for his science fiction and fantasy work, was born in 1963. In a satire magazine called Hara-Kiri, Moebius did 21 strips in 1963–64 and then disappeared for almost a decade. In 1975, Métal Hurlant (a magazine which he co-created) brought it back and in 1981 he started his famous L'Incal series in collaboration with Alejandro Jodorowsky. Moebius' famous serial The Airtight Garage and his groundbreaking Arzach (which Hayao Miyazaki pointed to as his influence for Nausicaä) also began in Métal Hurlant. Moebius has contributed storyboards and concept designs to numerous science fiction films and a bit of fantasy: Alien, The Time Masters, Tron, Masters of the Universe, Willow, The Abyss, Little Nemo: Adventures in Slumberland, etc. In 1988 Moebius worked on the American comic character The Silver Surfer with Stan Lee for a special two-part limited series. 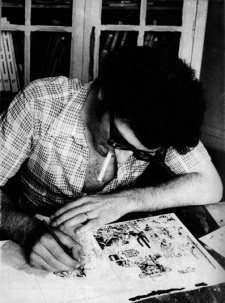 Giraud is also known to be a friend of filmmaker Hayao Miyazaki. From December 2004 to March 2005, the two of them shared an exhibition at La Monnaie in Paris which showcased work by both artists. He even named his daughter Nausicaä from Miyazaki's Nausicaä of the Valley of the Wind. Any fan should check out the anime Dragon's Heaven and the manga No. 5. Both are very influenced by his style and even story telling. « So Long, and Thanks for All the Fish ». Huh, I didn't know Moebius made Little Nemo's character designs and background art... I loved the NES game.